Praline & Gopher Duo - 50pc. Dark Chocolate Gophers - 50pc. Milk Chocolate Gophers - 50pc. Best Sellers Trio - 50pc. Gopher Assortment Box - 50pc. We've got our best selling candies available in bulk to fit your candy needs! Perfect sizes for wholesale or party favors. Call or email our dedicated wholesale team at wholesale@savannahcandy.com or 912-232-2639 to discuss an order of our Southern confections. Wonderful taste...fresh and shareable at the holidays. The pralines arrived as promised. Taste great, soft texture. Good cold but flavor is enhanced when heated . I order this for my support teams throughout the country and they are ALWAYS a hit. 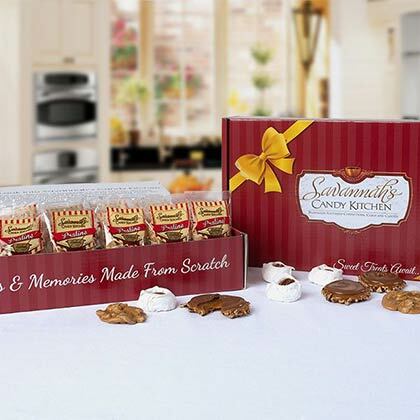 The best part is the accurate on line ordering and shipping from Savannah Candy Company, they are the best.